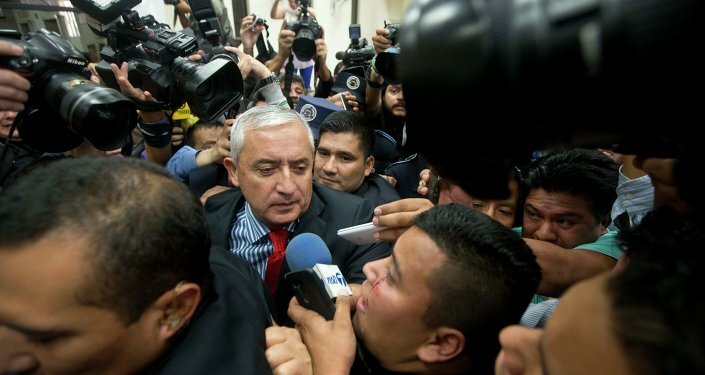 Former Guatemalan President Otto Perez Molina said that Washington's interference had led to his arrest. MOSCOW (Sputnik) — Former Guatemalan President Otto Perez Molina, jailed over corruption allegations, claims he is a victim of unjust accusations staged by the United States over his unwillingness to renew the mandate for a UN mission in the country. Last week, Perez resigned and was jailed for three months amid a major corruption conspiracy involving Guatemala's now resigned vice president Roxana Baldetti, which enabled officials to lower customs taxes in exchange for bribes. "The CICIG [International Commission against Impunity in Guatemala] has been an instrument that has served others, but not to strengthen justice. We see it really as an interference of the United States, who were the ones who most pressured for it. They orchestrated things so that it would lead to [my arrest]," Perez said to CNN in an interview on Wednesday. According to Perez, unnamed top US officials repeatedly asked the Guatemalan government to renew the mandate of CICIG, but the former president stated his intention to abolish the UN mission at the same time as the court ordered him jailed during ongoing corruption investigations. Acting as an independent international body, CICIG investigates illegal security groups and clandestine security organizations in Guatemala, according to the UN website. The illegal groups are believed to have infiltrated state institutions, fostering criminal impunity and undermining democratic gains in Guatemala following the end of the country's internal military conflict in the 1990s.